If you’ve been a Quicken user for any length time you’re well aware that the look and feel of the app has gone through some considerable changes over the last several years. Not to mention a brief name change from Quicken to Quicken Essentials and back to Quicken again. 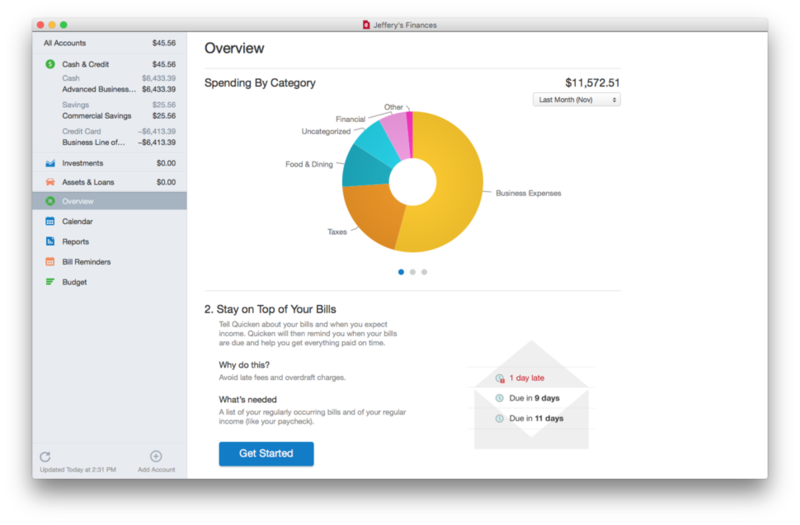 Quicken 2016 for Mac, the application resulting from this mini-morphing over the years, is a solid tool for managing your personal finances that remains as easy to use as was its predecessors, but it’s no longer the only personal financial player in the game. The setup of Quicken 2016 is a little uncomfortable from the jump, as it requires that you use a Quicken ID in order to set the app up. While I understand the purpose of using a Quicken ID—it’s used to sync Quicken data on your Mac with iOS devices—I don’t like that this is a requirement for using Quicken. Being able to save data in a local file seems, to me, to be something I should be able to do without linking to Intuit’s back-end, particularly if I have no plans to sync Quicken with any of my mobile devices. Also, once you log in you’re also required to complete a survey before you can begin using the app. Another unnecessary required step. 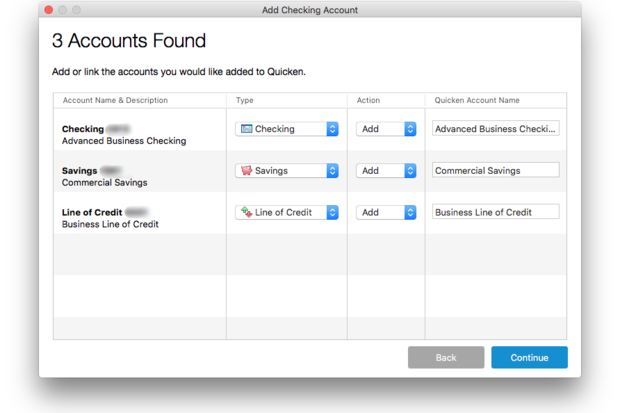 After signing in to your banking account, Quicken 2016 lets you select which accounts you want to sync. Once you complete those initial steps you’re off to the races. Quicken is designed to sync with your bank’s online banking services, but you do have the option of creating manual entry accounts if you want. I was easily able to create a link to accounts I had with two banks, but was unable to link to a credit union account because of the way that bank’s authorization system works. In short, that bank’s website requires that you enter answers to personal questions from a drop down menu. Quicken would only allow me to enter an answer by typing into into a field, which my banking site would not accept. Once you log in to your banking site, Quicken lets you to select the accounts you want the app to automatically download transactions from. When selecting accounts to sync, you also have the option of customizing the names of those accounts. Quicken downloads transactions for the accounts you link—typically three months worth of data, depending on your bank—as soon as you add them. Quicken ships with a pre-defined collection of categories and does a great job of linking imported transactions to existing categories, although you’ll likely want to double check to make sure everything matches up correctly the first few times you import transactions. I found that I needed to refine or edit categories to make them work for my specific needs. One of the benefits of automatically mapped categories is that you have instant access to a reasonably good set of reports. 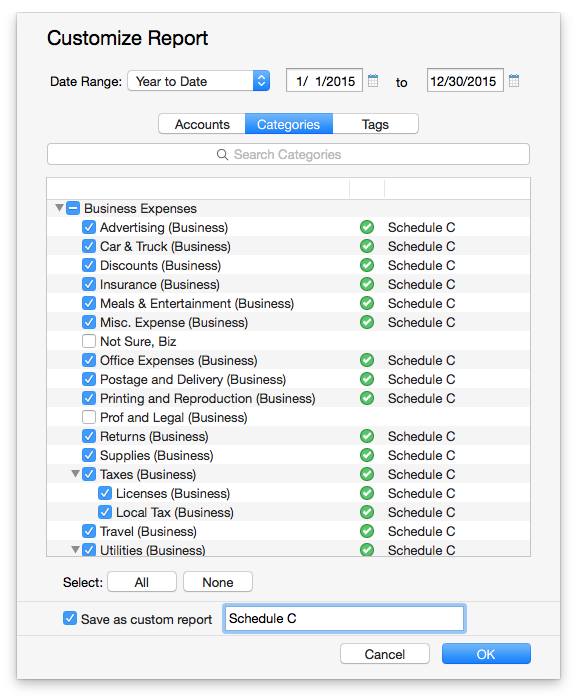 Quicken 2016 ships with nine reports, such as account and category summaries, net worth, and monthly spending, six of which can be customized and saved for later use. There’s also a Spending Cloud report, which is a vestige of Quicken Essentials and is more of a toy than a useful tool. Quicken 2016’s Overview screen helps you keep tabs on your income, expenses, and upcoming bills. Oddly, there is no way to create a custom report using any of Quicken’s menus. Instead you have to open one of the pre-defined reports, such as the Category Summary, select the date range, accounts, categories, and tags you want to use in your report and then select the “Save as custom report” checkbox before you click the OK button to run the report. Once saved, you can run or customize the report by selecting it from Quicken 2016’s sidebar. In addition to Quicken’s standard set of reports the app also provides a quick overview of your transactions, income, and assets, and lets you see whether or not you’re meeting the budgets you’ve created for yourself. Existing Quicken 2016 reports can be customized and saved for reuse. As mentioned in the previous paragraph, Quicken 2016 can track investment income and help you set budgets for every spending category. As with standard bank accounts, Quicken can link directly to and download transactions from you investment service if your investment service supports transaction downloads. Unfortunately, my investment account doesn’t offer direct downloads or offer the option to download transaction files. So for me it’s a manual only option for tracking my investment income. Quicken 2016 can quickly pull a suggested budget from three months worth of existing transaction information. It uses your categories to create the budget and allows you to select which categories you want to have included in your budget. The app will create a budget amount based upon your average spending for a particular category, which you can then adjust to match what you want your budget to be. I was easily able to set up a budget within a matter of minutes. Quicken 2016 is a good and definitely adequate tool for tracking your personal and small business finances, but it’s days of being a top tier personal financial app have long since passed. It is just one of many apps, some of which are far less expensive, that can connect to your bank, download transactions, and track your finances. While Quicken 2016 will serve you well, you’ll be better served looking at all your options before you put your money on Quicken’s bottom line.